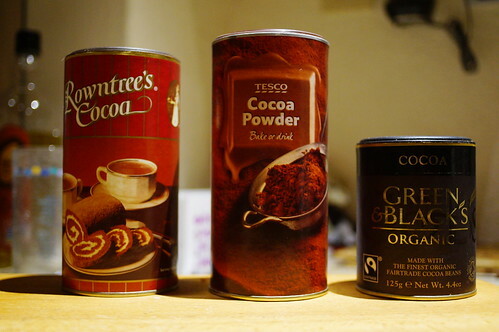 Cocoa, made from the cacao bean, fermented, crushed, dried, ground up, 'dutched' and goodness what else done to it, and put into tins marked cocoa. I drink it neat, with nothing but hot water, no milk and no sugar. Au-natural. Unlike coffee where they say what its like no-one seems to give tasting notes. So here is a simple opinion type review of the three brands I currently have. One of the first things to note that it is cheaper than the other two brands, usually. A brown powder, neutral smell, until you put hot water in it. It smells like fermented cigarette ends. At least that's what I imagine they might smell like because I haven't come across the real article, except possibly this product. It has a grey tint to it. Can you tell I don't like it. I really don't like it. I've tried putting coconut oil/milk in it, it masks the smell a bit, but... Moving on. This is more expensive than the other two. It comes in dinky 125g tubs whereas the others are 250g. Usual brown powder, put hot water into it, and it smells lightly of chocolate with a slight hint of bean. Drinkable neat, and obviously fine with other adulterations. Now this is the nicest of the three. Maybe because it has added flavouring, whatever is in that. It looks no different to Green and Blacks, but drinking it is much like hot chocolate without the fat and the sugar. Hmm. It's nice. Only trouble is obtaining the stuff. Drinking it as much as I do, or rather am allowed by my diet I get through a 250g tub in around a week. I think. It seems it's only Morrisons or maybe Waitrose that stock it.